Type of Friedberg 114-122 (W-1294-1302). 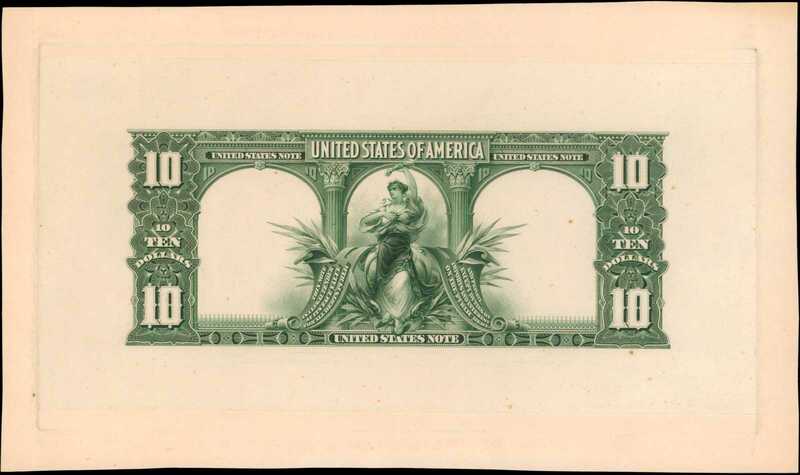 1901 $10 Legal Tender Note. PCGS Currency Choice New 63. Back Approval Proof.Hessler-483. India paper mounted to card. No back plate number. Allegorical vignette of Columbia between scrolls at center with arched pillars in background. Impressive styling that nicely ties the ornate 1890s series notes to the more openly designed pieces of the early 20th century. The only other color back proof we know to have sold publicly is a trimmed to size piece that brought $4,885 in a Stacks 2000 sale as lot 1019. Penciled on back "1901 LEGAL TENDER, D17." Blue 21821 at verso.From Harry E. Jones via private purchase.